GOLDEN OPEN Acrylics are a new line of colors and mediums for professional artists designed with a unique set of working properties that represent a true departure from all other acrylics on the market and that dramatically expand the range of techniques that are available to artists who prefer to use acrylics. GOLDEN OPEN Acrylics are formulated with an optimum balance of pigment load and 100% acrylic polymer dispersion to produce a paint with a uniquely relaxed set of working characteristics and a versatility that allows artists to explore a wider range of techniques such as portraiture and landscape painting that rely on softening, shading, glazing, and creating fine detail. GOLDEN OPEN Acrylics resist skinning, remain wet on the palette for extended periods and exhibit a remarkable versatility that allows them to be used directly from the tube for plein air painting, monoprinting and screenprinting. 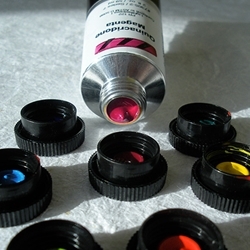 OPEN Acrylics may be blended with other GOLDEN Acrylic Colors, Mediums and Gels, with the open time of the resulting mixtures being proportionately reduced. To maintain the maximum working time of OPEN Acrylics, use OPEN Mediums and Thinner.